Flash My Brain - Master French with Flash My Brain flash card learning. 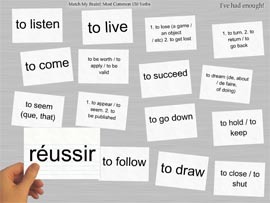 Master French with Flash My Brain flash card learning. Flash My Brain helps you study French. You can select from the many existing French sets made by Flash My Brain users, or create your own. 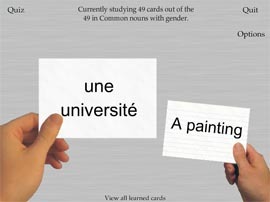 Make your own French flash cards with Flash My Brain. 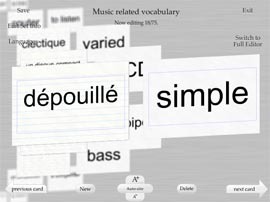 The streamlined and attractive interface makes making your French flash cards a snap. Print them out to study on the bus. Flash My Brain creates beautiful, easy-to-read French flash cards, but it doesn't stop there. 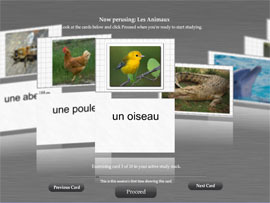 Upload mp3s of pronunciations to easily create talking French flash cards. Flash My Brain is an invaluable tool for learning French through flash cards. Buy Flash My Brain for $29.95 and master the French language with Flash My Brain flash cards. Positive reinforcement based learning encourages retaining the knowledge as long as possible, and mini-games make learning French fun!